Aid is a transfer of resources from a MEDC to a LEDC. Aid includes money, equipment, food, training, skilled people and loans. Short term aid is for immediate relief in emergencies such as famines, earthquakes, floods and droughts. This includes money, food, blankets, tents and medical supplies. Long term aid is for economic and social development. Its purpose is to improve the quality of life for people living in LEDCs. Short term aid gives help which can save lives immediately. Short term aid can develop into long term aid after a disaster, as people in MEDCs realise how poor people are in the affected zone. New industries can develop which improves peoples chances of getting skills and long term employment. It can lead to improvements in long term farming methods – introducing new crops and better land management practises. Trade with the donor country may continue into the future. Schools, hospitals, roads, dams and other infrastructure projects improve the lives of many people and will last for a long time. Give two advantages/disadvantages of aid? 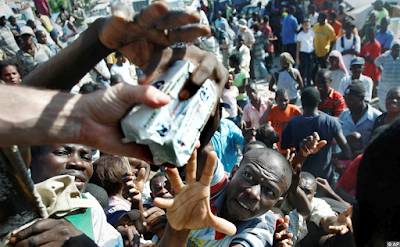 Using examples explain why some countries need aid? Using examples describe and explain two types of aid? What are the advantages of emergency aid to a country you have studied?